Movie of the simulation presented in Fig. 5A of the paper: Jönsson et al, "An Auxin-driven polarized transport model for phyllotaxis," PNAS 103(5):1633-1638 (13 Jan 2006). Shown is a simulation of the cell-based model, including cellular growth and mechanical interactions, on a shoot-like topology. 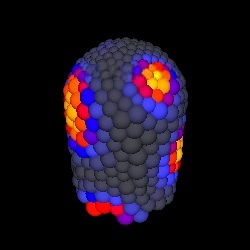 The initial auxin concentrations are random, and the simulation results in a spiral pattern. Additional supporting information for this paper is available.